Several years ago the Austrian Armin Suppan created an extensive list of current, traditional and successful marches. 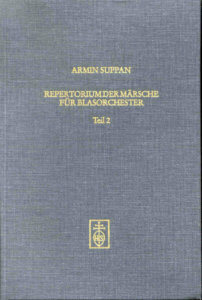 The title was “Repertorium der Märsche für Blasorchester” (Repertory of Marches for Wind Orchestra) Volumes 1 and 2. In addition to this extensive list of marches, Volume 1 contains a list of publishers and an alphabetical list of composers and their works. Volume 2 supplements Volume 1. After all, more than 5,000 marches are described in these two collections. If you are a member of the “Verein für Musikinformation”, you can access a compilation of all the marches in our database via a link to the respective books. Many of the compositions contained therein are linked to further information, sound examples, scores, etc. The two books have a scientific background and therefore do not consider whether these works are still available. We have endeavoured to identify the out-of-print titles.